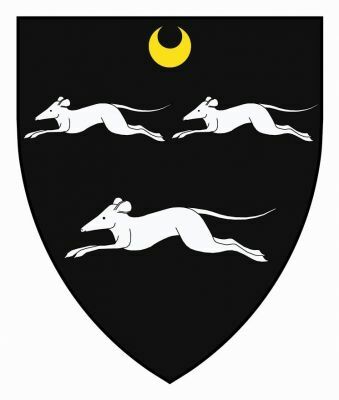 Arms: Sable, three mice courant, differenced by a crescent Or. Crest: a domestic cat couched as to spring Proper. Motto: As my Whimsy takes me and/or I hold by my whimsy. SOURCE/NOTES & CREDITS: The blazon illustration for the Arms of the Duke of Denver, came from, Pages 13 & 15, "The Wimsey Family" by C. W. Scott-Giles, Harper & Row, New York, 1977 with the difference of a crescent for the second son, thus being the Arms of Lord Peter Wimsey, done by the artist, J.H. Gaylor, with the text prepared by D.Q. Wedvick. (Major, Rifle Brigade). Author of: "Notes on the Collecting of Incunabula," "The Murderer's Vade-Mecum," etc. Recreations: criminology; bibliophily; incanabulae; music; cricket. Clubs: Marlborough; Egotists'. Residences: 110A Piccadilly, W.; Bredon Hall, Duke's Denver, Norfolk. At age 125 he would appear to hold the current world record as the oldest living person. The artwork is a rendition by John Hamilton Gaylor.